Over the past 10 years, carmakers have been slowly dropping minivans from their lineups and replacing them with now-ubiquitous SUVs and crossovers. Minivans became a dying breed, with most of us unable to move past memories of aged wood-paneled Dodge Caravans. But the truth of it is many families still need this segment. They need sliding doors and under-floor storage. They need seating for at least six and DVD screens to keep kids entertained and parents sane. So the manufacturers who are still in the game are beefing up their wares to attract the thousands of people who want (even if reluctantly) a minivan in their life. 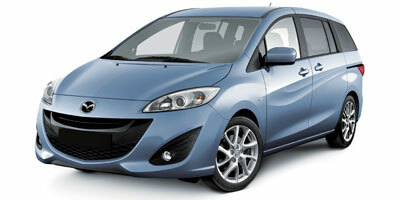 The all-new 2012 Mazda Mazda5 stands out from the faithful few by representing a smaller style of van. It seats six, as opposed to the seven or eight that traditional vans fit, has a smaller footprint overall, costs less on the whole and drives well. In fact, the Mazda 5 drives more like a car than anything else, giving it a leg up over the rest of the pack. Things aren’t all perfect with this car; the interior looks inexpensive and the lack of tech is surprising in a world of large touch screens and USB connections. And whether it will stand up to Ford’s upcoming entry into the ‘mini’ minivan segment, the C-Max, remains to be seen. Still, the new exterior looks great, the price is right and the small size – and resulting improvement in fuel economy – make a good option for many. Drive quality for this segment is superb. Steering is excellent, and the taut suspension keeps the car level in corners. The exterior design won’t please everyone, but the distinctive lines on the body panels are original and set it apart. This is the only compact minivan in the market (about 20 inches shorter than the Honda Odyssey), and it’s just the right size for families with small children or city dwellers. To keep pricing low, a few key necessities were excluded from the options list, such as power sliding doors and a USB plug. Modern families will have a hard time getting past these oversights. The third row is only suitable for small children, though headroom is surprisingly good. 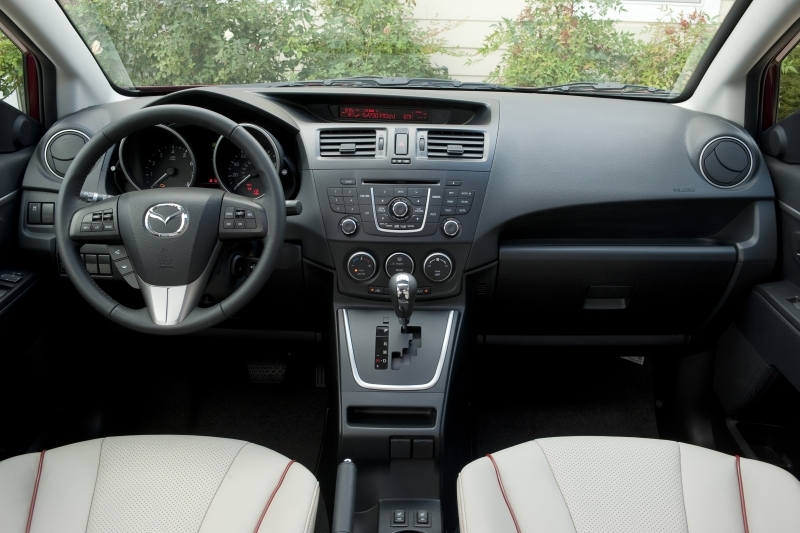 Interior styling really misses the mark, and hard plastics, a cluttered instrument panel and out-of-date display screen aren’t doing the Mazda5 any favors. 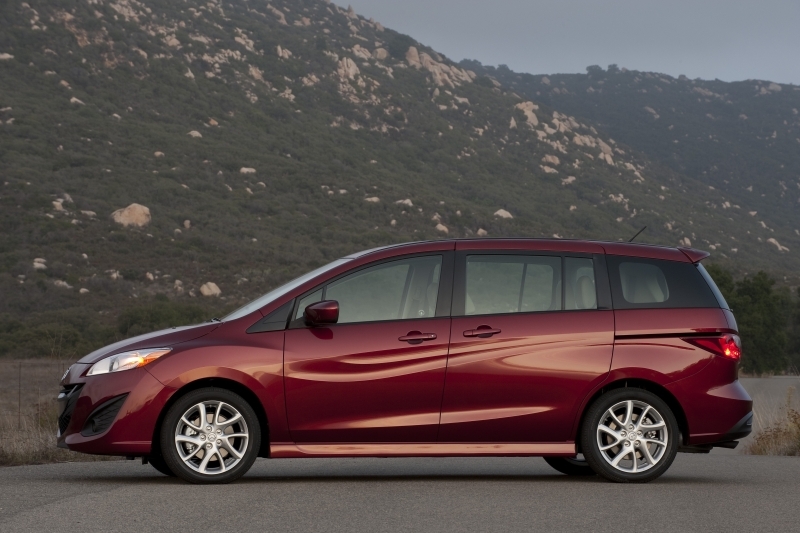 The highlight of the Mazda5 is far and away its dynamics. The Mazda’s suspension does a fantastic job of absorbing bumps in the road to keep your copilot comfortable and grounded during the drive, assuaging fears brought on by Mazda engineers’ declarations that they actually increased body roll to create a more comfortable ride for the passengers. Steering is equally as impressive for this segment; it’s direct and consistent. 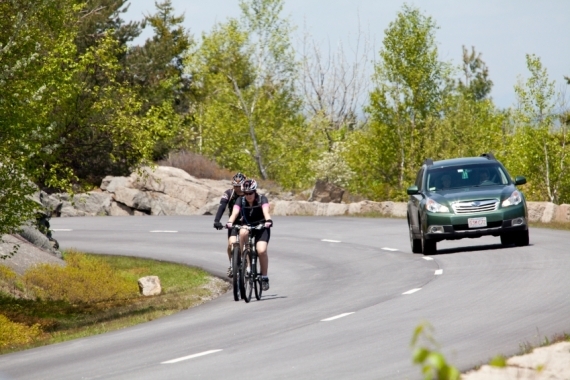 The four-cylinder engine can feel slightly underpowered at times (most larger minivans have a V-6), but the gearing on the automatic maximizes the powerband's character well. This is one of the few minivans to offer a manual transmission (only on the base model), and while the six-speed shifts easily in-hand, it lacks feel. As with most minivans, road noise is an issue with the Mazda5 – you sit very close to the wheel arches and are subjected to a persistent humming. Other than that, the cabin is comfortable; the engineers weren’t kidding when they said they made it a nicer place to be. A new 2.5-liter four-cylinder engine replaces the outgoing 2.3-liter. Producing 157 horsepower and 163 lb-ft of torque, it feels more powerful than you’d think looking at the numbers. The Grand Touring and Touring trims are available with a five-speed automatic, and the Sport trim has an additional six-speed manual to choose from. All are front-wheel drive. The Sport trim offers a basic array of standard features like an auxiliary input jack, tilting/telescoping steering wheel, under-seat storage and a second-row console table to keep the price low. 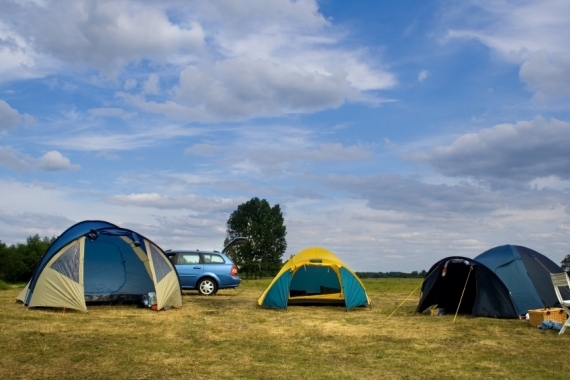 However, opting for the Grand Touring trim nets you standard lumbar support, six-disc CD changer, Bluetooth phone connectivity for audio streaming and a moonroof, among other treats. On the whole the Mazda5 is tech light. Standard Bluetooth (on the Touring and Grand Touring trims) with audio streaming is a great feature, and in the near future an overhead DVD screen will become available. However, key items, like a USB plug and rearview camera (or even a backup sensor) are missing from the overall package. With a size closer to the Toyota RAV4 and Mazda3, it comes as no surprise that the Mazda5 receives similar fuel economy numbers at 21 mpg city and 28 mpg highway. It bests the larger, V-6-powered minivans out there, but not by much, and we’d love to see them improve city numbers in the future. With seating for six, the Mazda5’s smaller cabin space isn’t noticeable in the first two rows of seats, which are comfortable and spacious. The rear seats can accommodate adults, but only with the second-row captain chairs moved far forward. A cluttered, plastic-y instrument panel and small display seem dated compared to the exterior design. 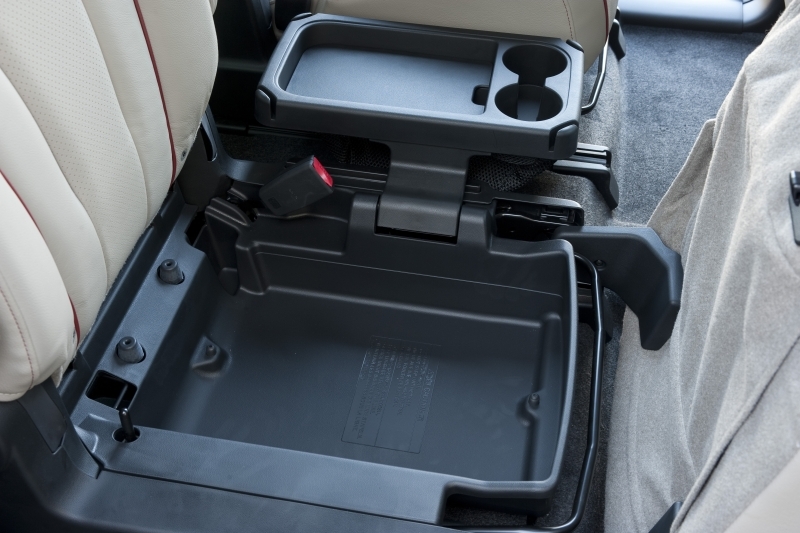 Storage spaces aren’t large, but are well placed throughout the cabin. The Mazda5 is the first Mazda to fully integrate the design elements first initiated in the Shinari concept. They call it nagare, and it is meant to represent flow. Trickling styling from a supercar concept down to a minivan may seem odd to some, but it actually works. The lines break up the height of the van, and the whole vehicle looks modern and interesting. Of course, it helps that the Mazda5 is only three inches longer than the Mazda3 5-door. Recognizing that a smaller vehicle would be best offered at a smaller price tag, the Mazda5 starts at just $19,990 for the Sport MT and tops out at $23,875 for the Grand Touring. No other manufacturer makes a direct competitor to the Mazda5 yet – look for Ford’s C-Max in late 2011 – so your best cross-shops are both larger minivans like the tried-and-true Honda Odyssey or Nissan Quest and compact crossovers like the Honda CR-V and Toyota RAV4.